The first Huddersfield College was a proprietary institution, founded in 1838 and opened on 21 January 1839 with make-shift accommodation in the Philosophical Hall. The foundation stone of the substantial, purpose-built premises in New North Road was laid in March 1839. The first report of the body in June 1839 announced that the half yearly distribution of prizes would be conducted privately during the week preceding the close of each half year. That format did not last very long, by midsummer 1842 the names of prize-winners were being printed in the report, and by 1845 the prize-giving became an annual event. I have encountered no evidence of the distribution of prize medals prior to midsummer 1841. The newspaper report of the June 1840 distribution records prizes of handsomely bound books, with no mention of medals. In December 1840 it was announced that Lord Morpeth, who could not leave Ireland, was to present a yearly prize of £5 for the best English composition and that it would take the form of a gold or silver medal of that value. In December 1841 it was recorded that the example of Viscount Morpeth in providing for the encouragement of English literature had been promptly followed by Mr Stansfield, MP, by the President [John Sutcliffe] and by the vice-President [William Willans]; that is that they had agreed to sponsor prize medals. The minutes of the Board of Proprietors record the preparation of a Gold Medallist Memorial Board in June 1861, but enquiries at the New North Road premises of the College, and at its successor at Salendine Nook, have failed to locate it. In 1872 an offer by the drilling master to present a silver medal was declined on the grounds that the giving of medals by any master was not desirable. New requirements were approved for candidates from 1875 for the Classical, Mathematical, French and German medals, which accounts for the high number of medals which were not awarded in 1875. On 2 July 1880 it was resolved that books be given instead of medals, with the consent of the donors, and it was announced at that year’s prize-giving that the donors of medals had consented to substitute books. The same report makes no mention of medals, nor do the minutes include any payments to Alfred Smith who had been supplying medals up to that date. However, the report of 1881 again lists medals rather than prizes! I can only suggest that whoever provided the printer’s copy forgot to alter the wording. The prize of a gold pen continued for some years. The College medals are attractive pieces and many, no doubt, remain in the possession of the families of the winners as treasured family heirlooms. Some have found their way into museums and others onto the market as desirable collectors’ items. In 1940 Philip Lee published a pamphlet The story of five Huddersfield College medals dealing with the three silver medals won by Matthew R Webb, a gold, being one of two, won by D F E Sykes and the silver won by Albert Shaw. The first four were in Lee’s possession and had all been purchased from local jeweller’s to whom they had been consigned at scrap values. Those medals subsequently found their way into the municipal collection at Tolson Memorial Museum, which now holds nine examples. 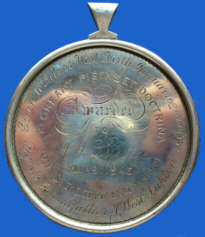 Shaw’s medal had been purchased by Hull Museum from a London dealer. The Fitzwilliam Museum in Cambridge holds the silver medal won by John Moreton, which was given to them by Miss M E Grimshaw, a noted medal collector. The earliest medals had a plain border which was soon superseded by a decorative cast border. The obverse of the medals usually carried the College motto Floreant pietas et doctrina, together with the names of the prize, prize-winner and donor, and the year. The reverses vary, the arms of the Earl of Carlisle, the arms of the Earl of Ripon or Earl de Grey and Ripon on the medals presented by him, an engraving of the buildings at New North Road, and, on some of the Commercial medals, a scene of commerce. Some examples are given on the relevant pages. The four medals won by Jonathan Bates are enumerated in Silver medals from Scottish & Irish schools before 1872, by M E Grimshaw, from which it appears likely that they were still extant, as a group. I am very grateful to John Rumsby of Tolson Memorial Museum, and J Richard Law, Huddersfield, for information supplied on the medals and medalists. HUDDERSFIELD COLLEGE MEDALS THE MORPETH AND CARLISLE GOLD MEDALS. THE MEDALISTS, an alphabetical list. THE MEDALISTS, biographical notes.